Braustein draught beer which is only 5000Vnd and really cold, fruit juices, other drinks and the food is excellent. 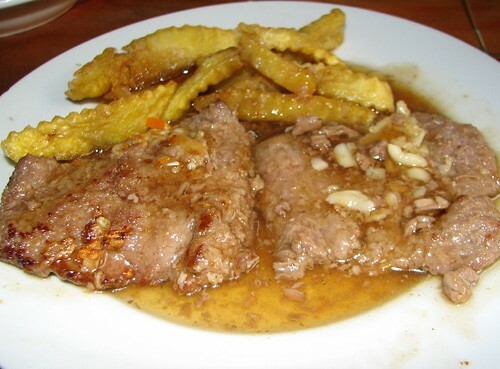 In actual fact, the beef steak is a bit oily but very tasty and there are lots of different dishes to try. 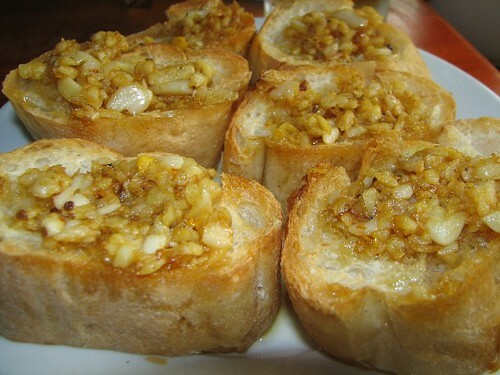 Garlic bread is my favorite besides the beefsteak and stir fried chicken wings. They also serve some favourites like fried rice and fried noodles. Due to southern accent, the staff are always a bit doubtful when they take my order and I also can't understand them sometimes because they also aren't from Hanoi but the lady-owner is really friendly and nice. 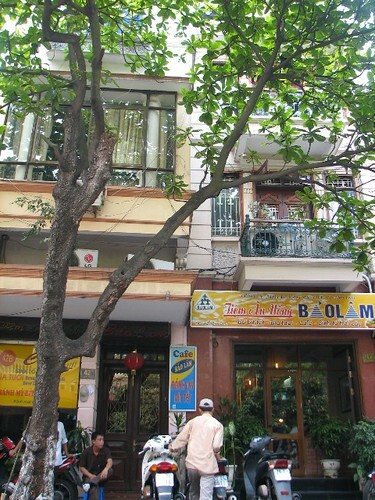 I just come there sometimes for coffee in the morning or at noon for the air-conditioning to hide away from the heat of 39 degree of Hanoi. I have been intrigued by this boy for a few months but this morning was the first time I talked to him. He normally doesn't want to talk to other people about himself or his family. He is a disabled boy who can't walk at all. He sits on a bicycle, using his hands to pedal and control the bike. 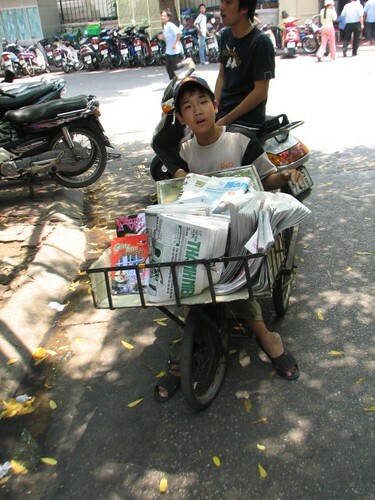 He started his newspaper business 8 years ago which means when he was 10. He doesn't look like 18 at all, a very baby face with a good smile that makes people think he loves to be alive and happy with what he had and has now. He starts his day at 6am and ends up at about 10pm, hopefully with no newspapers left. It's difficult to imagine how hard such a life must be, all day using his small hands to pedal around for thewhole day to earn a small income? Around Hanoi in small lanes and big streets, he cycles to earn about 30,oooVnd a day. A good thing about him is that he tries his best even though he is not in the best physical condition and lots of people try to help him by buying his magazines. I see lots of boys and girls who hang around, doing nothing, putting their hands out to their parents for money. Lots of people don't want to work to earn money, even though they are strong and there are thousands of jobs waiting for them. They are some who prefer to act sick or pretend they have a really urgent family problem to get sympathy and money. This boy should be an example to them all. I was really surprised about the motivation of small business operators here.There are a few girls in small boats hanging around very early in the morning, at about 5am, trying to sell all kinds of stuff, from rice wine to chewing gum or vegetables but all really expensive. From what I've seen and heard the people here are so nice and friendly. They are calm and always smiling. Maybe they are do that for their business but at least they know how to smile. 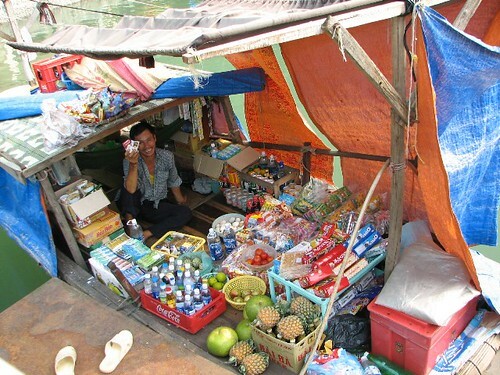 The boat stopped at a fishing village for whoever wanted to buy fresh seafood or check out the fishing lifestyle. 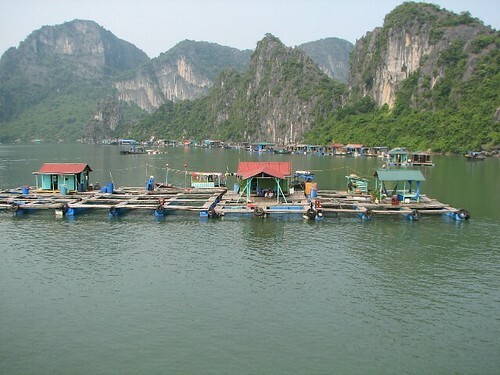 There are many floating houses located nearby and they have constructed lots of floating nets to keep the seafood in for selling. 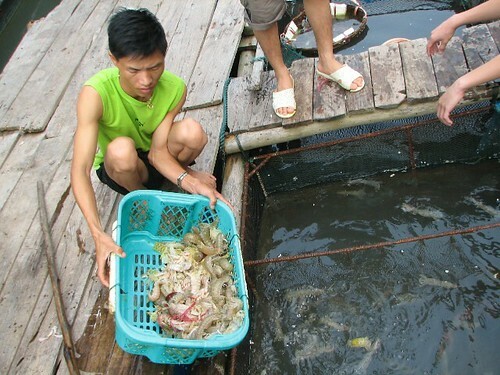 I bought some crabs and some prawns to bring home for a meal. I realized that it is more expensive than in Hanoi but I think the quality is better. Maybe I don't know how to bargain or that's the price for ocean service. I understand that people can live in all kinds of conditions, but I don't think I could live in the middle of nowhere for my whole life. People who live in this area seem very happy with their life. I saw quite a few guys and girls dyeing their hair with different colors and by the way they were talking, it seems that nothing can affect their life and they do really enjoy their life. 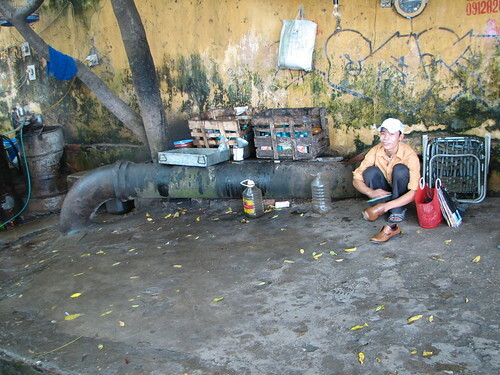 They earn quite a lot of money from their seafood business and they go to Hai Phong twice per week. They have all of the latest entertainment such as DVDs and the latest music. The local children have their own school. They have a pretty good life with whatever they want. 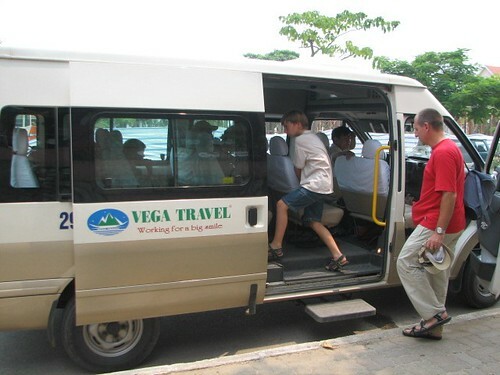 Vega travel is a very well organized tour company, and this tour was well worth what I paid. The tour guide was good, the boat and the bus were clean and driven well, and the bed was very comfortable and clean. 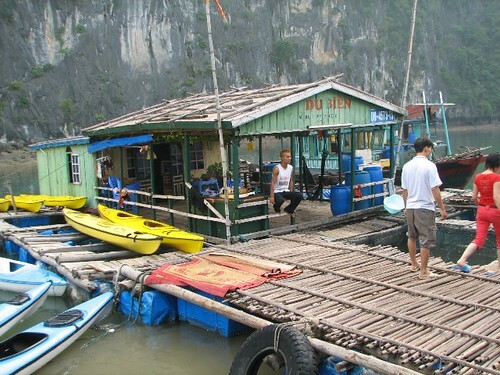 I think this is my high recommendation for whoever comes to Vietnam and wants a good tour agency. Vega travel: 24 Hang Bac- Ha Noi - Viet Nam -Tel: (84-4)9262092- Fax(84-4) 9260910 - Email: vegatravel@fpt.vn or go to their website: http://www.vega-travel.com/. Sorry about no posts but my work has been busy and I had some time away for the Independence day holiday.